So posting every day in May didnt work so well. My computer broke last week. Anyways, on to the actual post! I haven't posted about my quilting projects in awhile, mostly because I've been going through a little dry spell inspiration-wise. But hopefully, I will get out of it soon, our chapter of the Modern Quilt Guild (link on the right) is doing a little challenge...we all swapped 2.5 inch strips of "dot" fabric (some dots are a little bit looser interpretations of a dot..), and are challenged to create something out of the pack of strips. there's quite a variety of colors/patterns, so I don't really know what I'm going to do with them. And we agreed to keep the process secret..so I cant really post any more that that about the project! I do have a top to share today though. Made out of Tula Pink's Hushabye line, I attempted a pieced circle quilt, ala this tutorial at this and that. 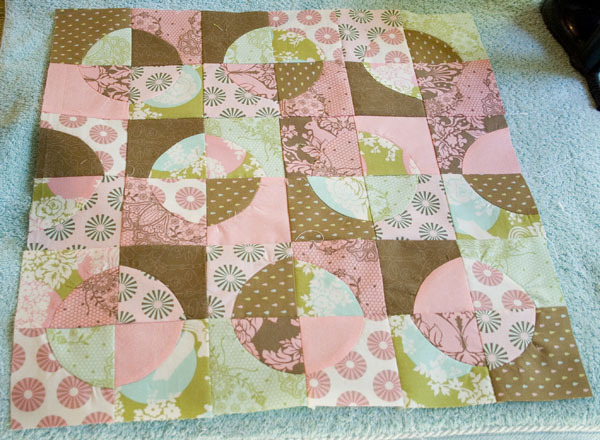 I did veer from the tutorial a little, I didn't want to sew from the middle out, my blocks were about half the size of the tutorial, so doing it that way would create a lot of unnecessary starting and stopping. I pinned my pieces, starting from the center going out, and sewed from one end to the other. I also had the square piece on top so that I could ease in the piece without puckering. Which still occurred occasionally. I'm hoping you wont notice the few puckers once its quilted. I'm not sure what to do with it now, its a bit small at 15in square, I cant decide whether to border it, or bind it as a small doll quilt/wall hanging/table topper...any opinions?